This just in by ABC Action news, Those who text while driving in the state of Florida may have some serious motivation to break the habit. 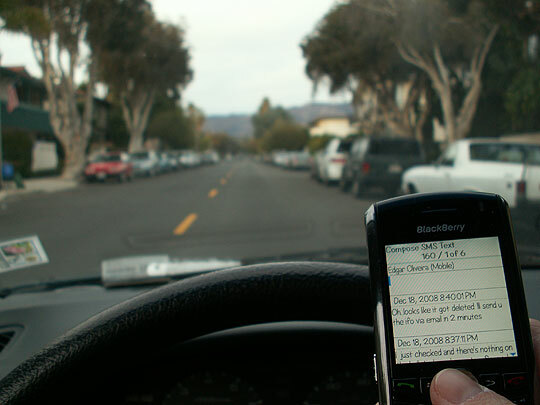 The Senate Transportation Committee approved the no texting and driving bill by a 10-0 Wednesday. The House companion bill, however, has not made it’s way through the committee process yet. Offenders caught breaking the ban on texting while driving would face six points on their driver’s licenses, court costs and a $30 fine, according to a North Escambia news report . The law prohibits driving while manually typing or entering any keys on a wireless device as well as reading messages on those devices. The exceptions to the rule are those who use hands-free devices and emergency responders. Legal questions are asked everyday. Questions about traffic ticket violations, underage drinking, roommate issues, personal injury claims or what is the foreclosure process. The most common issue with those asking questions is not having the funds to get them answered. Blick Law Firm is here! We social media concepts to create an even better way for individuals to get free consultation. ‘Minute with Mike’ is here to bridge the gap as Attorney Michael Blickensderfer sets out to answer posted questions himself. Created by USF Graduate Dana Blickensderfer, this free video campaign encourages legal discussion questions with Attorney Blickensderfer. According to Dana Blickensderfer, it is the best way to get the community involved in asking questions and knowing their rights in various situations. Starting as a campaign geared toward college adults, students are able to submit questions to Attorney Blickensderfer who will provide a video answer on the website every Wednesday at Noon. Michael Blickensderfer has extensive experience in personal injury litigation and claims. Attorney Blickensderfer has served as both a prosecutor and defense attorney in Florida and Rhode Island. Other areas Attorney Blickensderfer has served in were narcotics, Medicaid fraud, DUI offenses, and criminal law within the felony division. Other legal experiences are security and labor law, real estate, and family law. Every week, the Attorney will receive legal questions for responses through the forum. From the received questions, he will pick which ones to discuss and answer on air through a video channel set up on the official website ( www.oneminutewithmike.com). Tune in every week at noon to see if your legal questions were answered. The archive to legal questions will remain available for view of legal answers at your leisure. Blick Law Firm not only offers this free Question and Answer format on ‘Minute with Mike’ but also, with a student ID, we offer free consultation in person or over the phone. Whatever legal questions you have, don’t remain in the dark with the answer. What are you waiting for? Think Quick, Ask Blick. 813-931-0840. Driving stoned vs driving drunk? Which one is more dangerous? According to the TBT this weekend a recent study found although driving under the influence of marijuana undermines behavior, drunk driving is clearly worse. While alcohol and marijuana both impair driving abilities, driving drunk has a more severe affect than driving stoned. A new study showed that a drunk driver is approximately 10 times more likely to cause a fatal accident than a stoned driver. Smoking one-third or less of a joint has no severe influence on a drivers ability. Pot smokers driving abilities may alter smaller tasks like staying in a lane; alcohol impairs behaviors that need more attention such as noticing stop signs, pedestrians and alcohol even increases risk-taking behavior. Overall the findings have shown that those who have taken a moderate dose of marijuana show minimal impairments. However, taking marijuana and alcohol together creates a much greater hazard than taking either one alone. Do not do drugs and do not drink and drive. We do not advocate any of the behaviors in this article. However, if you find yourself in this unfortunate situation call your Tampa criminal attorney today and seek the representation and guidance you deserve. Think quick, call Blick at 813-931-0840.